As soon as they got the chance, many Māori travelled by sailing ships and explored European life and technologies in Sydney and England. Chiefs who reached London in the early 19th century often got a royal reception. But back in New Zealand, settlers in the new towns displaced Māori. From the late 18th century Māori travelled the world, often as crew on board sailing ships. 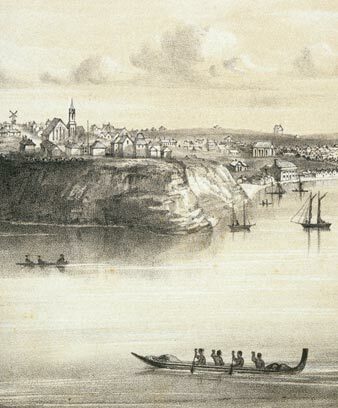 Sydney was the first city most Māori saw. People travelled there to meet British officials or missionaries, and to find out about new technologies. One of the first Māori to visit London was Moehanga of Ngāpuhi in 1806. He was presented to King George III. By the 1840s around 1,000 Māori had travelled overseas. Māori supported early European settlement, and traded produce for goods such as tools and clothing. They agreed to the sale of land for towns because they thought trade would increase. In Dunedin Ngāi Tahu chiefs discussed a deal which would leave a tenth of the land in Māori ownership, but when the deeds were drawn up this land was left off. The local population was devastated by disease introduced by Europeans, and by the time Dunedin became a city in 1865, Māori were marginalised. In Christchurch Ngāi Tahu chiefs signed deeds which set aside settlements and reserves, but when the land was surveyed the land areas were reduced or ignored altogether. The New Zealand Company negotiated deals to purchase land in Wellington with some chiefs and not with others. By the time the sales were investigated, the European population was 3,500 and Māori numbered only 500–600. Māori retained some of the land set aside for them. In the early 2000s this was administered by the Wellington Tenths Trust. Ngāti Whātua in Auckland also rapidly lost land. Their last land at Ōrākei was taken by the government in 1951. When Auckland became a city in 1871 there were few Māori living in New Zealand cities. In 1900 more than 95% of Māori lived in rural kāinga (villages), and ventured into cities only on official business or for education. Māori schools were established by the Catholic and Anglican churches for boys and girls in both Auckland and Christchurch. Few Māori schools prepared students for further academic study. But some Māori made it to university. Peter Buck and Tūtere Wī Repa were the first Māori doctors, and Āpirana Ngata was the first lawyer. Ākenehi Hei was the first nurse. During the Second World War, Māori who did not fight were encouraged to move to cities and work in essential industries. By 1945, 25% of the Māori population lived in urban areas. Government departments encouraged further migration to cities, and by 1966, 62% lived in cities. Māori adapted their culture to fit city life. In Wellington the Ngāti Pōneke club was established in 1937, so young Māori who moved there could socialise and participate in their culture. Māori sought out churches that other Māori attended, or where services were conducted in Māori. In time urban marae were established. Some were pan tribal, but others were connected to just one iwi. Kōhanga reo and kura kaupapa Māori – pre-schools and schools providing Māori-language education – began in the city. In the 1980s urban authorities developed to support urban Māori.